The craftsmen at LionSTEEL in Maniago, Northern Italy, manufacture the DPx H•E•S•T™ II Woodsman fixed blade knife. 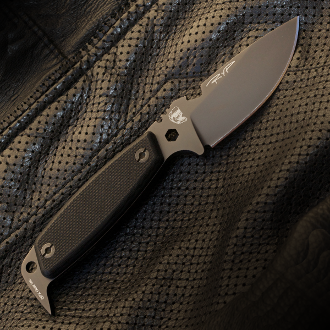 This knife is the Italian-made answer to the original DPx H•E•S•T and features various enhancements to the original configuration, including Sleipner steel, a revised pry bar angle and a slightly modified hollow handle. Sleipner steel is a chromium-molybdenum-vanadium alloyed tool steel that boasts extreme wear resistance, resistance to chipping, edge retention, hardness (60 HRC) and excellent “toothiness” in fine cutting. The blade of your knife has been either stone washed (Woodsman) or Titanium Carbo-Nitride (TiCN) PVD coated (Assault).